This past Saturday CruiserGear posted up about a scavenger hunt where Blake left a goodie box near the south end of Utah Lake at the base of West Mountain where a lot of folks go shooting and stuff. I saw it on social media and right after work decided to go find it. 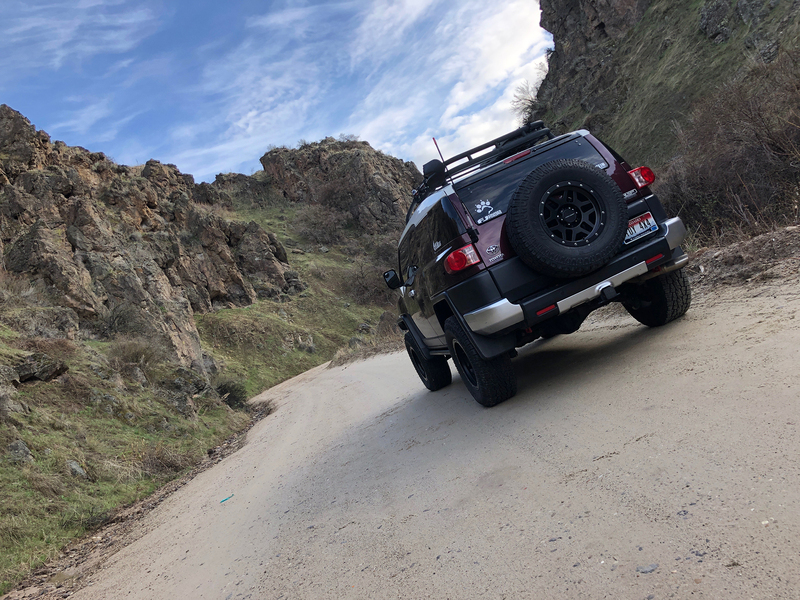 Unfortunately someone had already beaten me to it, but I then just off-roaded around the area on West Mountain and had a good time! Met some nice folks who were in a Jeep and they decided to take the normal dirt road that winds up the mountain. Meanwhile I noticed a trail that looked steep but takes you straight up the mountain... so I went that way! In my mind I was racing the Jeep to the top but they didn't realize it. I definitely had to go into 4Lo to do this climb and it would have been a whole lot smoother and easier had I aired down, but with the aid of A-TRAC and the rear locker at one point, I flew up the mountain as quick as possible and when they got to the top the Jeep folks were so confused on how I could've gotten there since last they saw me, I was behind them! Fun times were had. There was a snow drift still across the road that prevented us from getting to the very top. I tried to drive through but it was to thick and slippery, and with it being on a precarious slope, I opted out of gunning it. The Jeep folks decided to try it since I offered to help if they got stuck. Well they didn't get stuck necessarily but I did get to use the winch to rescue them from almost sliding off the mountain! It was a beautiful evening and the sunset was awesome! Need to go up there again! Great pics, Hayden! Pretty country out there. CRFjockey and amaclach like this. Went camping. Last camp before the heat really hits. It was 37c today. CRFjockey, ZerosFJ, debFJVT and 8 others like this. Well no shortage of sand to fill the tent 'anchors'. Zed 71, amaclach, Loganbeere and 1 others like this. Oof. I start melting at 82*F.
Went driving in the hills above Boise today. Shaw Mountain Road is an unmaintained gravel road with potholes and runoffs big enough that we aired down. We went up the west side of the mountain and it was super easy. The east side of the mountain is shady. It was still icy on the way down! amaclach, debFJVT, FJFool and 5 others like this. It was a touch warm. Slept with the tent wide open like in the pic. If the kids weren't there I would have just slept on a stretcher in the open. FJFool, Loganbeere and Lee44 like this. 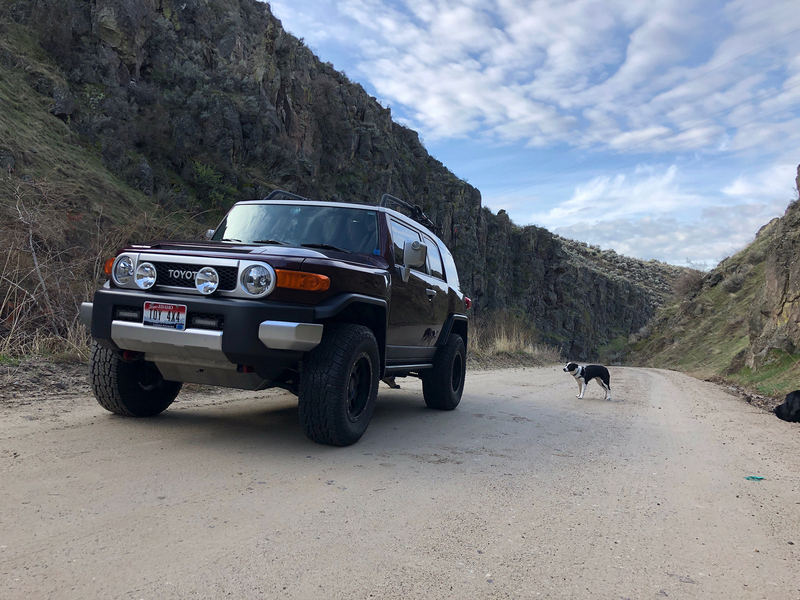 My daughter used to take my FJ out for “mountain rides” whenever we’d be out of town for the weekend. She was out of town this weekend so I returned the favor with her FJ!! Haha! CRFjockey, debFJVT, FJFool and 4 others like this. So how was it being back in an FJ? And standard? Had a blast! The manual is always such a connected experience. My 4Runner was a manual and always felt like I had more control. Left-footed braking is similar but takes a little longer to get used to IMO. Using the clutch just feels more natural for me. CRFjockey, ZerosFJ, amaclach and 1 others like this. I had a couple of conference calls in a row, mostly in listen mode, so I deflated and drove around some dunes to stop myself zoning out or falling asleep while I listened in. Zed 71, ZerosFJ, Bad Wolf and 6 others like this.